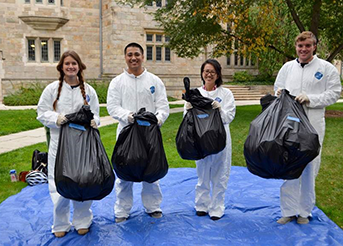 This month, Yale launched a Pay-As-You-Throw (PAYT) pilot program in select locations across campus to advance the University’s goals around responsible waste management. Traditionally, PAYT is a system where homeowners are charged based on the amount of waste that they produce, just as utilities are charged based on usage. These programs typically reduce waste and increase diversion (reuse and recycling) by creating a monetary incentive to generate less trash. Yale is the first American university to pilot PAYT, which is being used increasingly by municipalities across the country and abroad. The university setting is an ideal space for innovative research opportunities and Yale’s leadership in this area represents a commitment to becoming a more responsible, sustainable institution with consideration for its surrounding community and environment. The process for developing PAYT at Yale brought together faculty, staff, and students to help solve an operational challenge; a task force was convened in fall of 2017. In addition to assessing the opportunities and potential obstacles of implementing PAYT at Yale, the task force identified necessary research projects to properly inform the pilot program: a review of the PAYT system that exists in another higher education institution, the Australian National University, and a comprehensive assessment of Yale’s current waste disposal data. The results from these projects, in combination with expert consultation, helped to inform how PAYT would be defined and piloted at Yale. Select campus buildings were randomly assigned to one of three treatment groups or one of two control groups. Buildings were identified and selected based on availability of data and whether they share a waste collection space with other units. Although actual billing will not be affected during the pilot, the traditional charge and traditional charge plus information treatment groups will receive monthly “test bills” which show how much the building would be charged for the quantity of trash produced. This will differ from the current protocol, whereby buildings are charged based on square footage, regardless of the amount of waste produced. Full results from the pilot and suggestions for the future will be released next fall. In the meantime, answers to common questions can be found on the Yale Office of Sustainability’s website.